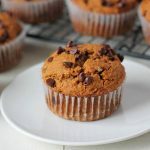 Fluffy, moist, and delicious gluten-free vegan sweet potato muffins that are loaded with mini chocolate chips and contain the perfect balance of warm spices! 2. 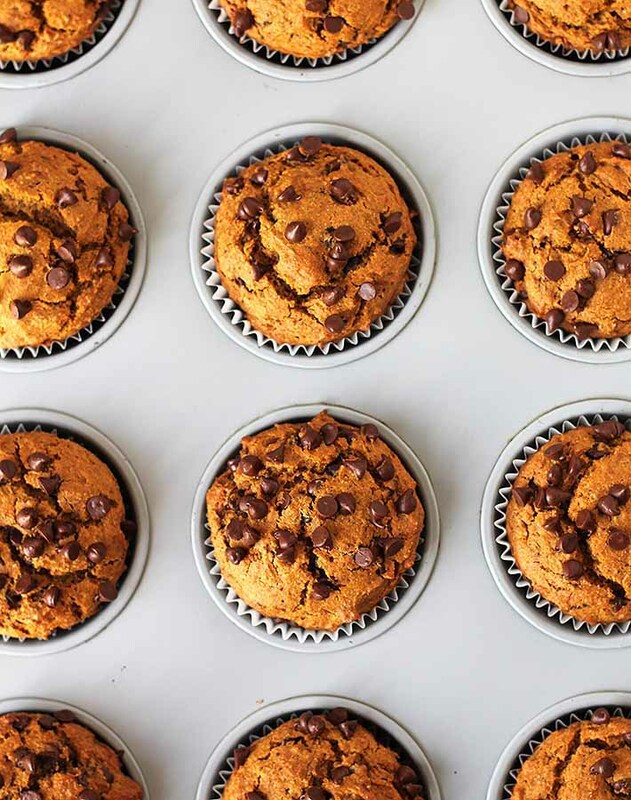 Give those leftovers a total makeover and make a batch of these very easy-to-make vegan sweet potato muffins. Put those leftovers to good use! 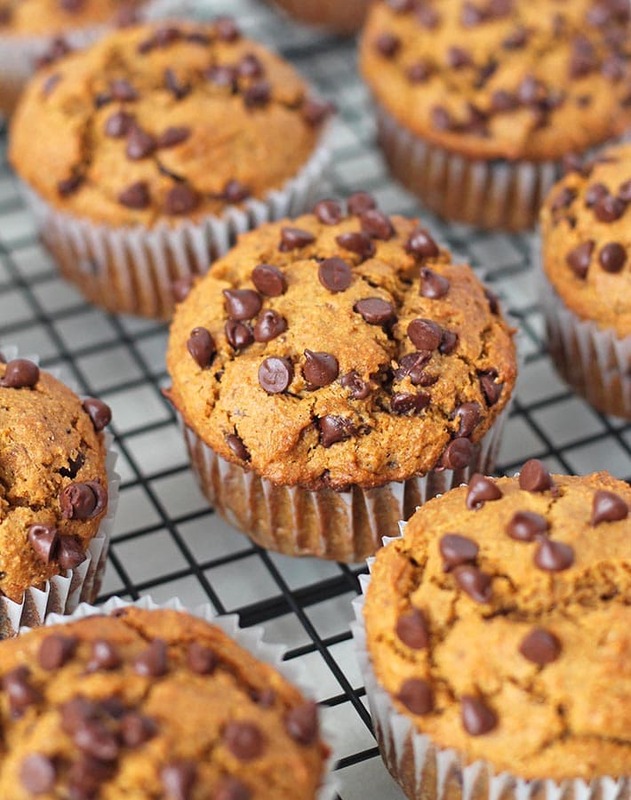 Of course, you don’t have to make these muffins with just leftover sweet potatoes; you can bake up some sweet potatoes especially for this recipe. Or if you have a pressure cooker, my favourite way to make sweet potatoes is by making Instant Pot Sweet Potatoes so they finish in a fraction of the time, compared to baking, which means your sweet potato muffins will be ready even quicker! Note: You can also use leftover sweet potatoes to make these gluten free sweet potato pancakes! This recipe is very similar to my vegan gluten free pumpkin spice muffins , they just have a few small differences, like the spices used. Cinnamon, nutmeg, and cardamom give these gluten free sweet potato muffins the perfect balance of flavours. And did I mention how easy they are to make? They come together in just a few minutes, so you can have these muffins ready to take out of the oven in just 35 minutes. I usually make these muffins during the fall and winter because that’s when sweet potatoes become a go-to side dish in my home. 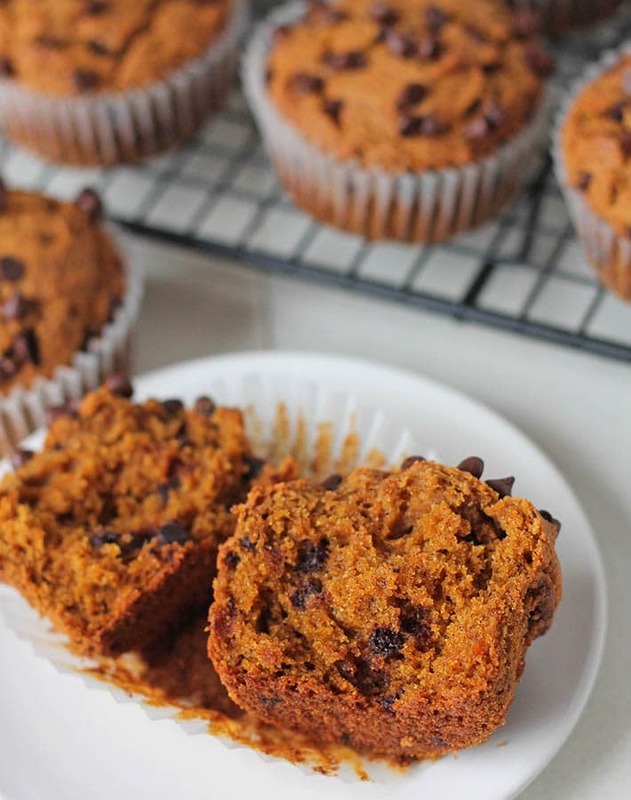 When I make sweet potatoes, I try to make a little extra so I can bake up a batch of muffins for snacking on throughout the week and for school snacks. As mentioned, they’re great for snacks but they’re also nice to have at breakfast, to serve at brunch, to bring to a potluck…basically, they’re good for all occasions! I used mini chocolate chips in the muffins you see in the photos but I have also made them with regular chocolate chips. I also sprinkled a little on top of each muffin but that is optional and only if you want slightly more chocolate. No, but I highly recommend it 🙂 If you don’t want to use them though, you can replace them with raisins, dried currants, chopped walnuts or chopped pecans. Will coconut oil make the muffins taste like coconut? If you use extra virgin coconut oil in this recipe, the flavour will not come through at all, you won’t even know coconut oil was used. If you don’t have coconut oil, any other neutral flavoured oil will work in this recipe. Have a look at the picture below 🙂 They’re soft, fluffy, moist, and perfect. They’re everything you have been told that vegan gluten free baking is not! 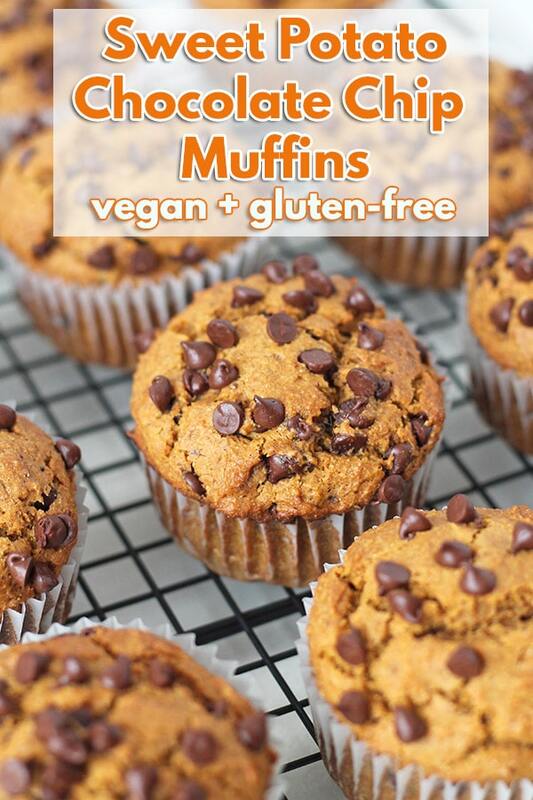 If you make these muffins, please share a pic with me on Instagram by tagging me! (@delightfuladventures) or by leaving a comment below. And please sign up for my newsletter so you can keep up with all of my new vegan gluten-free recipes! In a medium bowl, whisk together the flour, baking powder, baking soda, salt, cinnamon, nutmeg and ginger. In a large bowl, mix the coconut oil, vanilla, and flax eggs together. Stir in coconut sugar and pumpkin puree until blended. Slowly add the dry mixture to the wet mixture and stir until combined. 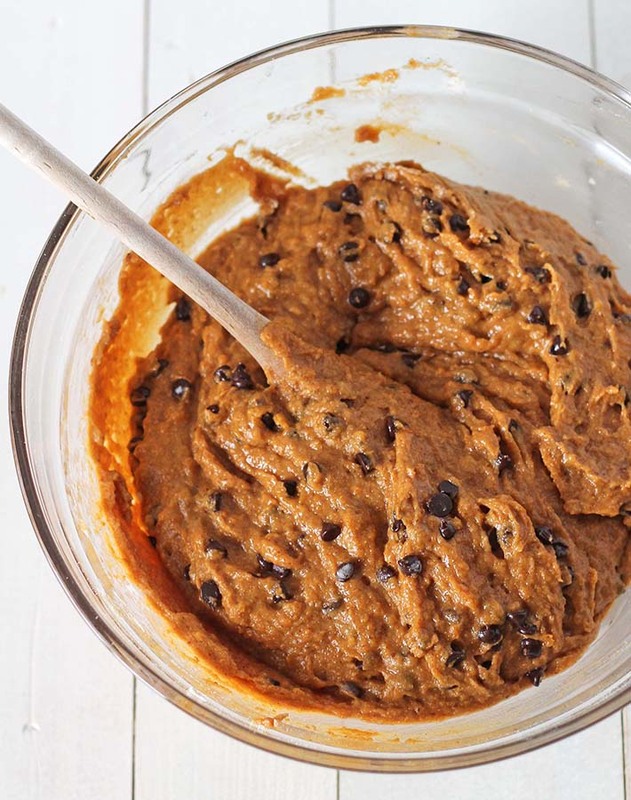 Fold in chocolate chips or raisins. Be sure that your sweet potatoes are fully cooled and mashed very well so there are no lumps. This can be done with a fork or you can puree them using a hand blender or food processor to make sure they are as smooth as possible. Raisins, dried currants, or nuts (chopped walnuts or pecans) can be used in place of the chocolate chips. I like to use an ice cream scoop to add the batter to the muffin pan as shown in the picture above (this is the one I have). If you don’t have a scoop, you can use a tablespoon. 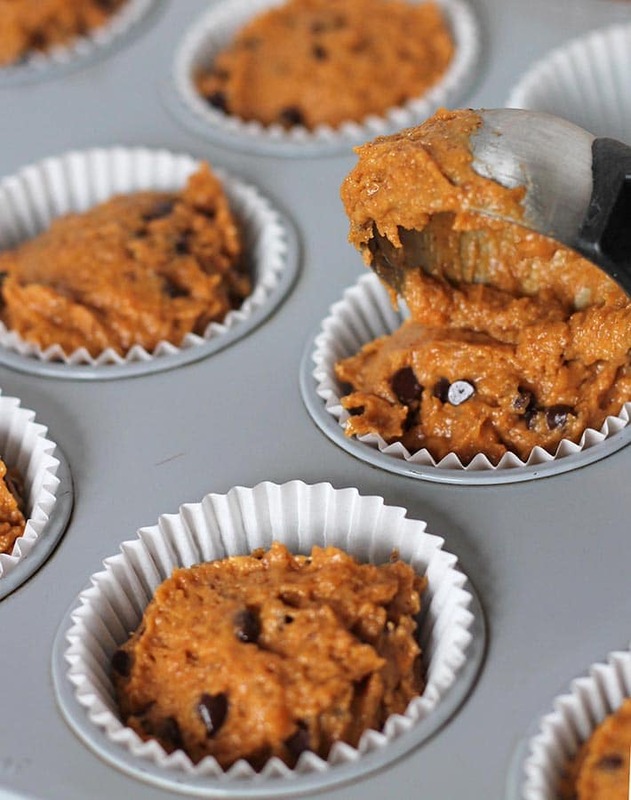 Be sure that each muffin cup has roughly the same amount of batter so they all finish baking at the same time. Store leftovers in an airtight container and eat within 2-3 days. Nutrition info is based on 1 muffin made with mini chocolate chips in the muffins, none on top. Nutrition info is only to be used as a rough guide. Click to learn how nutrition info is calculated on this website. And could I keep these out of the fridge for 3 days ( road trip ) thanks! Hi Patricia! 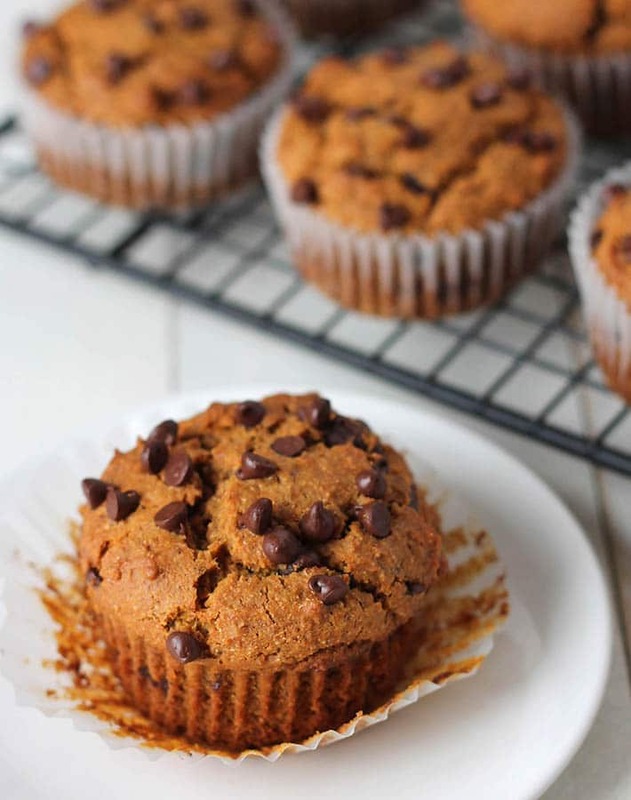 I think squash would work just fine, but if you do use squash, I suggest using my pumpkin muffin recipe (click here to see it) instead of this recipe and use the squash instead of pumpkin. Let me know how it goes!